We have a mixed environment of XP and Windows 7. Of course this doesn’t make things any easier trying to support both operating systems. Below I’ll outline how we deployed our printers. Both our AD and Print server are Server 2008 R2 Enterprise. If you need to just deploy for 1 of the operating systems skip to Deploying XP Printers or Deploying Windows 7 Printers. First off we had to separate the XP and Win7 machines into separate OUs. We found out if deployed all the printers the same way either 1) It wouldn’t install on Xp or 2) Windows 7 machines were restricted access to the printers. So we sorted all the staff machines as all our student machines are currently XP. 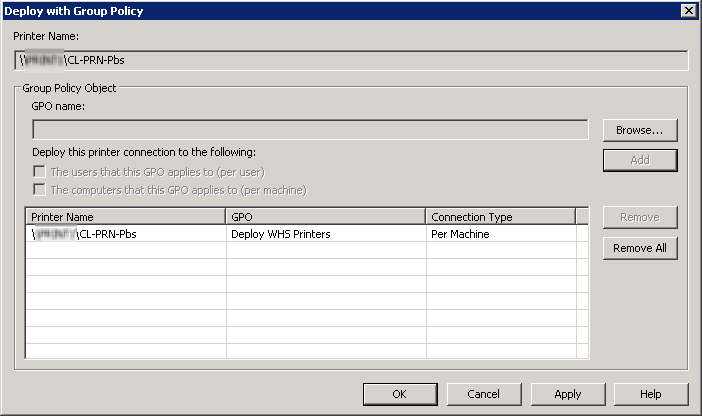 In your Group Policy Manager create your new group policy you will deploy the printers with. I’ve always done this by Action-Location-What. As you can see in the picture below Deploy WHS Printers Win7 and Deploy WHS Printers. Ok now we just need to edit the XP Group Policy. We will need to add a pushprinterconnections.exe to the start up scripts ONLY FOR XP. This is NOT necessary for Windows 7. Open up the Group Policy Editor for the XP policy. 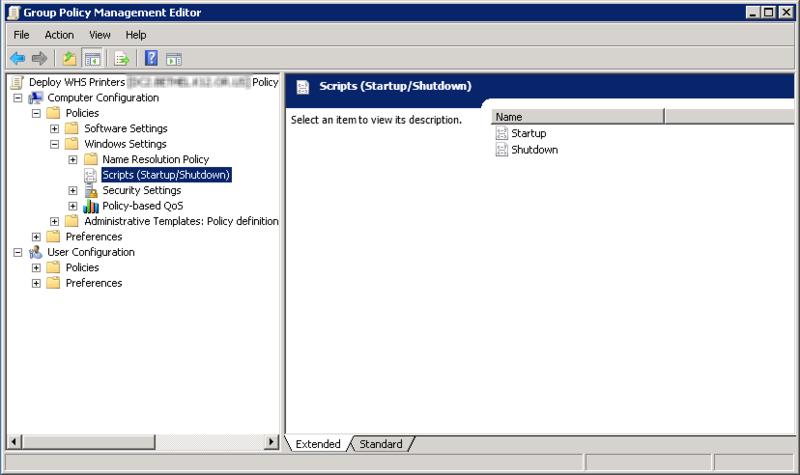 Navigate to Computer Configuration > Policies > Windows Settings > Scripts (Startup/Shutdown) and double click Startup. Click add and browse to the pushprinterconnections.exe you should of downloaded earlier and click Ok.
Add the pushprinterconnection.exe to your XP Group Policy. Your now done with the group policy editor. Before we begin you should of added the pushprinterconnectins.exe to your XP group policy. If not, its the step right before this. If your just deploying for Windows 7 you can just begin the steps below as pushprinterconnections.exe is not needed. Open up your Print Manager and right click the printer you want to deploy. 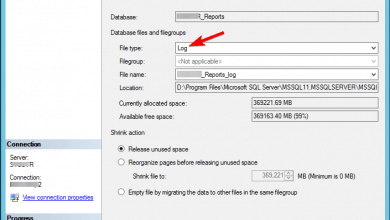 Select Deploy with Group Policy. The new window that pops up click Browse and navigate to your group policy you created to deploy your XP Printers and click OK once selected. Next you will be asked how you want to deploy it. Per user or per machine? I do per machine. Put a check in The computers that this GPO applies to (per machine), and click Add. Put a check in The computers that this GPO applies to (per machine), and click Add. Click Apply and Ok. Your done with XP! To test find a computer that is in the OU. 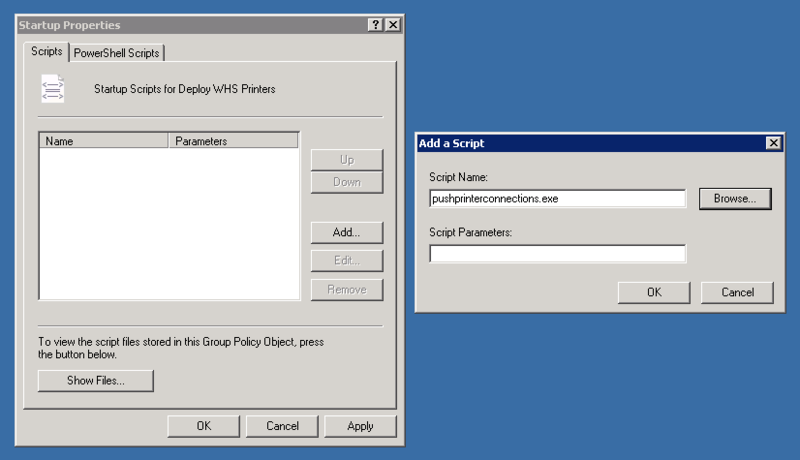 Open a cmd prompt and type in gpupdate /force to force the machine to acquire the new group policies. What if you adding more then 1 printer and you need one of them to be the default? How would you do that per machine?